Pelipper is a Water/Flying type Pokémon introduced in Generation 3. It is known as the Water Bird Pokémon . The effectiveness of each type on Pelipper. 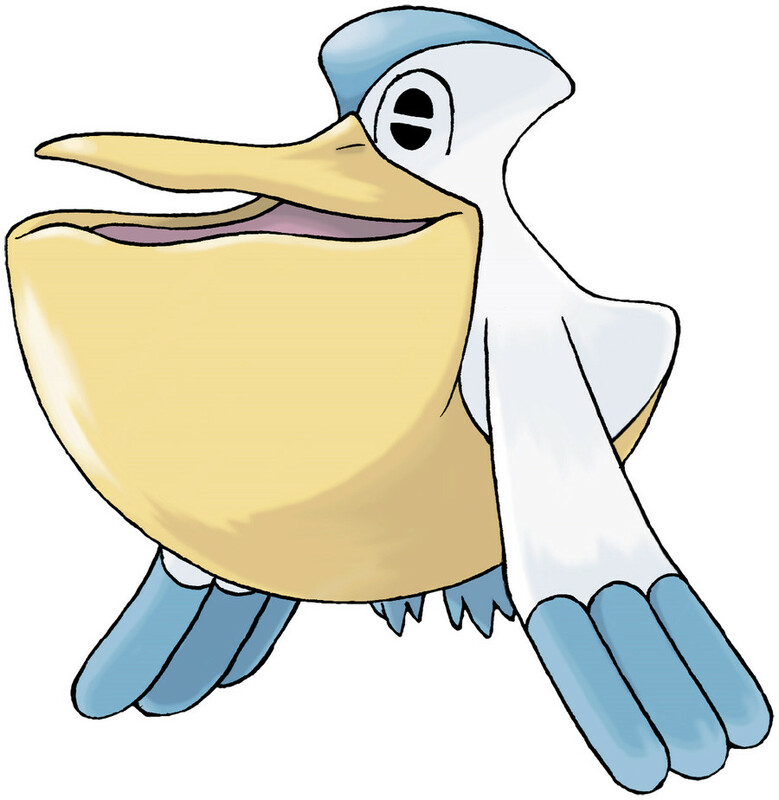 In Generations 3-6, Pelipper does not have the Drizzle ability. In Generations 3-6, Pelipper has a base Special Attack of 85. In Generations 3-4, Pelipper has a base experience yield of 164. In Generations 5-6, Pelipper has a base experience yield of 151. Skimming the water’s surface, it dips its large bill in the sea, scoops up food and water, and carries it. It places small Pokémon into its spacious beak and carries them around. No one knows where it’s taking them. Pelipper learns the following moves in Pokémon Ultra Sun & Ultra Moon at the levels specified. Pelipper learns the following moves when it evolves in Pokémon Ultra Sun & Ultra Moon (regardless of level). Pelipper learns the following moves via breeding in Pokémon Ultra Sun & Ultra Moon. Details and compatible parents can be found on the Pelipper egg moves page. These moves can only be learned in Pokémon Ultra Sun & Ultra Moon by a previous evolution of Pelipper. Check the respective Pokédex for the exact details. Pelipper can only learn these moves in previous generations. It must be taught the moves in the appropriate game and then transferred to Pokémon Ultra Sun & Ultra Moon. Pelipper learns the following moves in Pokémon Sun & Moon at the levels specified. Pelipper learns the following moves when it evolves in Pokémon Sun & Moon (regardless of level). Pelipper learns the following moves via breeding in Pokémon Sun & Moon. Details and compatible parents can be found on the Pelipper egg moves page. These moves can only be learned in Pokémon Sun & Moon by a previous evolution of Pelipper. Check the respective Pokédex for the exact details. Pelipper can only learn these moves in previous generations. It must be taught the moves in the appropriate game and then transferred to Pokémon Sun & Moon.